We’re coming to even more screens near you! The Broadway Channel, featuring exclusive video content provided by Broadway.com, will now make the Broadway experience accessible to millions of households nationwide with the over-the-top (OTT) channel’s debut on Apple TV, Amazon and Roku. 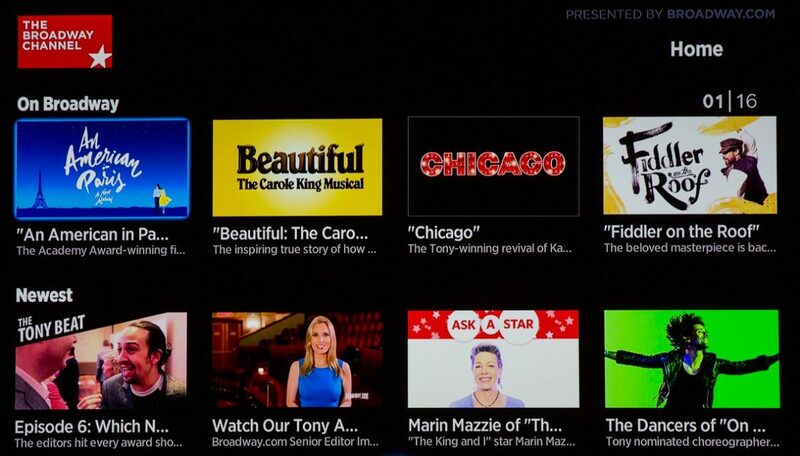 The Broadway Channel, available at no charge, will launch on June 15 on Apple TV and will also be available by visiting the Amazon Fire and Roku online stores. The new Broadway Channel app is the premiere destination for all things Broadway including Broadway.com’s coverage of the 2016 Tony Awards and exclusive behind the scenes footage from the 11-time Tony-winning production of Hamilton featuring the weekly video blog series, Aaron Burr, Sir: Backstage at Hamilton with Leslie Odom Jr. Broadway.com’s exclusive video content made its broadcast television debut last weekend with the CBS half-hour television special Broadway.com Presents At The Tonys with Imogen Lloyd Webber that aired in 27 markets nationwide and will be further available on the Broadway Channel app. The Broadway Channel will bring theater fans everywhere unprecedented video content, including red carpet coverage, behind-the-scenes access and exclusive interview features. Highlights include: One on One chats between Broadway stars and Broadway.com personalities including Lloyd Webber, Broadway.com #BuzzNow breaking news stories, Fresh Face features on rising talents, documentary-style Character Study videos offering an inside peek at the actor’s process, Building Broadway stories with creative team members, Ask a Star segments with top stars fielding fan questions, as well as popular talk shows Show People, hosted by Paul Wontorek and Side by Side by Susan Blackwell, along with backstage vlogs hosted by the stars themselves.